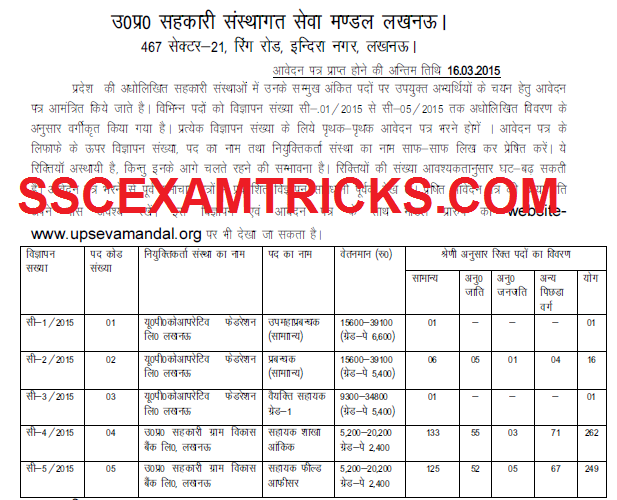 UP Sahakari Sansthagat Seva Mandal (UPSSSM) has released notification advertisement on 12th February 2015 on the official website for a total of 529 vacancies/ posts of Managers and Personal Assistant in various departments. The offline application was started from 12th February 2015. The last date to apply offline/ closure of offline registration is 16th March 2015. It is advised to the candidates to read the guidelines/ instruction before applying online for these posts. The interested candidates can download notification/ advertisement and apply by downloading application duly filled in all respect and send the same to undersigned address. The final selection will be made based on the performance in written examination and interview of the candidates.